October 10th-15 2010 Hollyhock Educational Retreat Centre, Cortes Island, B.C. International Guild of Realism (IGOR): "Winter Salon Online Juried Exhibition" - Exhibited on the official IGOR, American Art Collector, and Quality Collections of Fine Art websites. - "Grassland Harmonies" was juried into this exhibition. 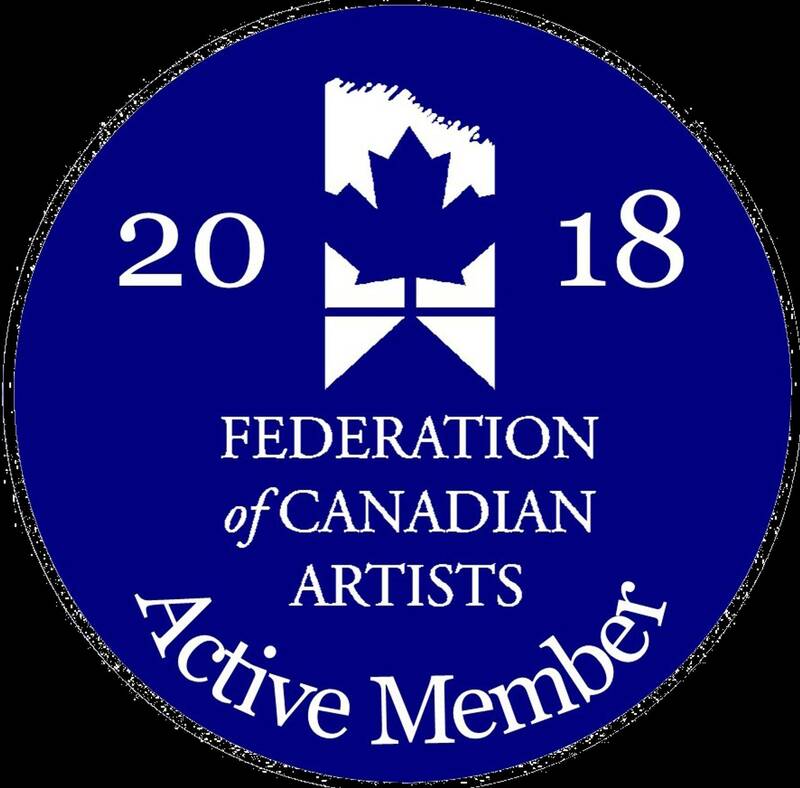 Federation of Canadian Artists: "Active Members Exhibition" - Federation Gallery, Vancouver B.C. - "Beating the Odds - Swift Fox" was juried into this group exhibition held by the Federation of Canadian Artists. Federation of Canadian Artists: "Scenes From Western Canada" - Federation Gallery, Vancouver B.C. - "Navigation - Pronghorn" was juried into this group exhibition held by the Federation of Canadian Artists. - Worlds top conservation themed art exhibit, exhibiting work from some of the worlds leading wildlife artists. A portion of all sales in this exhibit are donated to support conservation efforts. "Intimate Reminder - Burrowing Owls" was juried into this exhibition. Artists For Conservation: "Art for Conservation" annual international juried exhibition of nature in art, Vancouver B.C. - "Emergence - Pronghorn fawn" was juried into the Live exhibit, and "Grassland Harmonies" was juried into the online virtual exhibit. "Precious Frogs Exhibition" Science World Vancouver, B.C. -Group show raising the awareness of amphibians and amphibian conservation Geared toward supporting the Oregon Spotted Frog recovery teams efforts to conserve amphibians in British Columbia. "Plains Spadefoot Toad" in exhibit. -Exhibition featuring 35 originals from The Grassland Series. -Solo Exhibition as a Feature Exhibit at the Royal Alberta Museum, exhibition marks the premier exhibition of The Grassland Series and includes over 60 original works by Colin Starkevich. - Exhibition on Show wall near reception desk: Ferruginous Hawk, Bindloss Buck, Eye's on the Road-Rattlesnake, Autumn in the Parkland (for sale), and Childhood Dream. - Eight original paintings currently available in this Gallery: Arctic Places, Gyr Falcon, Heading North, The Wanderer (Semipalmated Plover), Signs of Spring-Western Meadowlark, On the Ridge-Musk Ox, On the Move-Grizzly Bear, and Pleasant Surprise-Barn Swallow Chicks. - Exhibited 5 paintings along with artwork from 3 other student artists. - Exhibited 8 pieces of new and past work outside the theatre where the TEDx talks were held, group exhibition. The TEDx talks were motivational speakers speaking about overcoming challenges and demonstrating talent through art, singing, and playing music. -Featured 8 pieces of past work on the 3rd level of the City Hall building in Lethbridge, AB. - Mural painted in acrylic depicting Osprey on main wall in lobby area at the Alberta Society for Injured Birds of Prey (Strathcona Raptor Shelter). - Exhibition featured wildlife art and plein air paintings, 26 pieces exhibited. -Oil painting: Great Plains Toad, on display in showcase. -Four original paintings exhibited: Coffee Run, Morning Solitude, Sturgeon River Goldeneye, and Northern Leopard Frog. -Displayed over 15 pieces of new and past work to students while speaking to them about the challenges and dedication one has to put in to their art work if they want to be a serious artist. -Displayed: Autumn in the Parkland, The 82nd Street King, Dawn of a Prairie Night, Marianne’s Portrait, American Avocet, and Sturgeon River Goldeneye. -Spoke about some of my artwork and some of my experiences with nature to encourage others to get outside and enjoy nature. - Spoke about my work in The Grassland Series discussing my goals with my work in that series. - Spoke about the Get to Know-your wild neighbours program and the opportunities this program provides for young people who have a passion for nature and the arts, ending by speaking about my current work and how my involvement with the program has been one of my supporters over the years. At a celebration event hosted by the Rotary East club of Lethbridge and the Get to Know program, I was happy to speak to a youthful audience about finding their passion in life and tying it into their talents to make a positive difference in our natural world, sharing a little of my personal experience about my own artwork and passion for the Grasslands. -Spoke to the public in backyard of The Wallace Stegner House about my artwork, the Get to Know-your wild neighbours program, and what I have been working on during my stay as artist in residence for the month of June 2015. -Spoke to grade 6 and 7 students about my artwork and opportunities for them as young artists through the international Get to Know-your wild neighbours program. -Spoke for an 45 minutes to 4 different classes of High School art students about finding your passion in art and excelling at it. -Presented a 15 minute presentation about The Grassland Series and what I wish to achieve with the series and why I think the Grasslands are important. I was selected as one of 12 youth (aged 25 and younger) from across North America to present a statement art piece or project at this international Unconference. I was then selected as one of the top 3 presenters and was interviewed by Shaw television in a segment featuring the top 3 presenters from this conference. The segment can be found on my videos page. - Spoke about my experiences with nature and encouraged youth to enter into the 2012 “Get to Know” Calendar contest. -Spoke about my experiences with the Get to Know program as a contest winner alumni, and honored youth delegate. -"Among the Shadows - Mule Deer", was featured in this section of the magazine a long with other artists work featured. - Awarded the artist of the month through the Artists For Conservation organization. - One of 10 artists selected to be featured in the prestigious "Art of Canada" section in this international magazine's special annual collectors edition issue. -Awarded artist's residence for the month of June at the internationally known, Wallace Stegner House. During my stay as artist in residence I worked on creating plein air pieces of the Grasslands region of Canada, as well as worked on fine art pieces and gathered reference material from the surrounding Grasslands for new works to The Grassland Series in the future. - Selected as one of 12 youth (aged 25 or younger) from North America to present a statement art piece or project. I presented a 15 minute talk about The Grassland Series. I was then selected as one of the top 3 presenters by the panel of judges and was interviewed by Shaw television in a segment they put together about the Unconference. The news segment can be viewed on my videos page. - As a recent finalist in the 30th annual international artist's competition through "The Artist's Magazine", I have been privileged to have an editorial and ad about my work featured in the January 2014 edition of the prestigious Southwest Art magazine. The editorial and ad can be found on pages 60 and 75 respectively. - My oil painting “Grassland Harmonies” was selected as a finalist in the professional division in the Animal/Wildlife category in this prestigious international art competition. There were over 6000 entries among 5 categories worldwide in the 2013 competition. My name and hometown was published in the December, 2013 issue of The Artist's Magazine. An accomplishment that I am truly proud of as being selected as a finalist competing at a professional level in this international competition at the age of 23. -I was selected as the male winner of the western provinces in Canada for this award. It was a scholarship for 2,008 dollars for my post secondary education. The scholars were selected based on set career goals, volunteer experience, and community involvement. -I was selected as the winner of my age group for the contest with my oil painting. My work was featured in the 2008 “Get to Know” calendar and on items and in wildlife magazines sponsored by the “Get to Know” program. *All donations to Ducks Unlimited Canada (DUC) are auctioned off at DUC events in order to raise money to help conserve and protect Canada’s wetlands and the creatures within them. * Taxidermy mounts are of professional quality, not study skins and were donated for the College's wildlife collection to provide specimens to help students with their wildlife identification skills which will become important to them for their future careers in the wildlife conservation/environmental fields.